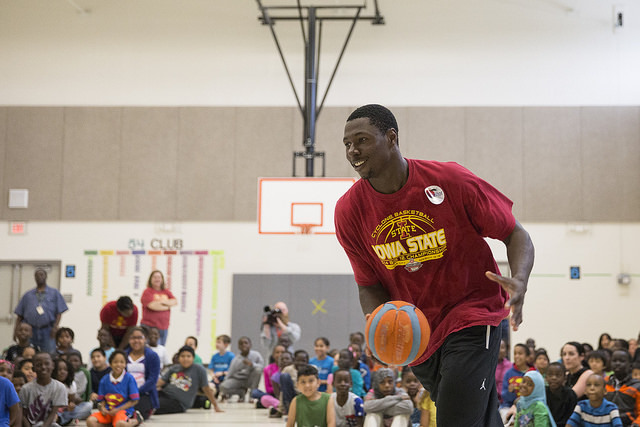 Former Cyclone basketball player Daniel Edozie shared his story of overcoming adversity with students at Edmunds Elementary School. Daniel Edozie wandered through his audience like he used to wander the streets of skid row. At 22 he is a decade removed from the crossroads of his life but listening to him talk it sounds more like a galactic distance away. His recent graduation from Iowa State University amounts to the summit of a personal mountain that climbs from London through Boston, Las Vegas, Los Angeles, Texas – even Nigeria. Monday morning Edozie came down from his mountaintop to tell the kids at Edmunds Elementary that whatever obstacles and hardships they might face in their lives can be overcome. Even if they don’t grow up to be 6’8” and play college basketball as Edozie did for the Cyclones. Megan Kruse is a Success Case Worker at Edmunds and a serious ISU fan. She’d seen Edozie play many times before she learned about the improbable personal odyssey that brought him to Ames in a story that ran in USA Today during the basketball season. It occurred to her that many at Edmunds might hear echoes of their own sagas in Edozie’s so she contacted Iowa State’s athletic department to extend an invitation. It was eagerly accepted and Monday came the payoff. Edozie spoke freely and candidly about coming to America with his mother in 2004 only to panhandle and live by his wits in a series of homeless shelters. He described his mother as neglectful and abusive. Eventually the temporary immigration status by which they entered the country expired and they were apprehended as illegals. Only when the son finally and desperately abandoned a mother who had effectively abandoned him already did Edozie begin to cross paths with the people who collaborated to gradually save his life: police officers, a foster mother and an immigrant advocate. At age 12 Edozie was already 6’2” but the only thing he possessed that wasn’t lugged around in a trash bag was the positive attitude he says he always maintained in the absence of any logical reason for it. “I always believed that things would turn out alright,” he said. Maybe he just had a child’s intuition that some good fortune was overdue. His blind faith in the future was finally rewarded. Now he intends to take a stab at professional basketball somewhere before eventually becoming an attorney. Ironically, his opportunity to play basketball for a living might come somewhere overseas. Endozie came to talk about life but the kids wanted to know about basketball. So when he finished speaking and fielding questions he agreed to one unanimous request. Putting down his microphone and peeling off his warmup jacket to reveal the t-shirt that matched the gallery of ISU Cyclone artwork that adorned the gym where the assembly was held, Edozie grinned and picked up a basketball that Kruse just happened to have on hand. Kids dig dunks, especially rim-rattlers like the couple that Edozie treated the Edmunds gang to on a basket that’s beyond their current reach. Then the biggest, luckiest kid in the room posed for some groupies with a couple hundred of his newest and closest friends.